I don’t completely understand why the press seems to be quite harsh on Kaiser Chiefs over The Future Is Medieval, nor why it’s not selling well (according to that same press). I was totally not impressed by the previous album, Off With Their Heads, except for the single Never Miss A Beat. But The Future Is Medieval is certainly a lot, a lot better again. It’s a tiny bit more experimental than I was used, has lots of variation, the well-known energy, poppy lyrics, enough fun and more of the great stuff that we’ve come to appreciate the Chiefs for. Is it that I’m just realistic enough and fair enough for not expecting replica songs for their extraordinary debut album singles? Am I then setting my expectations too low? As far as I’m concerned, musical quality has certainly gone up again on this 2011 work. And not even I like the drummer singing too much. But, hey, give the band some space for inner peace. And I even haven’t composed my own album and created matching artwork (mind: it’s only for fun currently), but just went for the boys’ own choice. So, I take it that all the admiration (the press, you know) of the “brilliant” move to let their listeners participate has somewhat faded again? Does that make the concept less? No, can’t be. And, but I may be alone with that opinion, it can’t be the music. 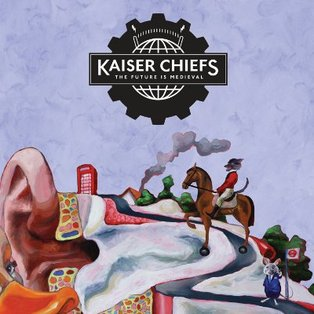 There is future for the Kaiser Chiefs, and that future isn’t medieval… Even if their recording budgets are cut, or they get kicked out of their record company, or whatever medieval practices are applied on them.